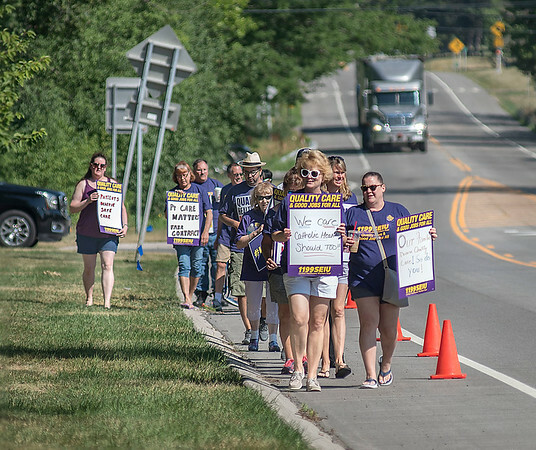 Niagara Falls, NY - Mount St. Mary's healthcare workers picket to protest short-staffing and high turnover rates at the hospital. Caregivers warn that chronic under-staffing is dangerous and negativelyimpacts quality care for patients. Date: Tuesday, July 10, 2018 - 10:00 a.m. until 6:00 p.m.
On Tuesday, over 400 registered nurses, nurse’s aides, laboratory and technical staff, dietary and environmental service workers providing care and services on every floor and in every department of the community hospital will hold an informational picket to protest short-staffing and high turnover rates at the hospital. Mount St. Mary’s employees are represented by 1199SEIU, United Healthcare Workers East, and have been in negotiations for a newcollective bargaining agreement since September 2017. The informational picket is not a strike. Workers will picket on their own time—lunch, breaks, a day off, etc. - to alert the community of severe quality care concerns at the hospitaland seek community support in their fight for a new union contract that includes the fair wages and benefits needed to recruit and retain caregivers and other healthcare workers and provide the best quality care to Mount St. Mary’s patients. You are receiving this message from Allison Krause, 1199SEIU, allison.krause@1199.org at 1199SEIU United Healthcare Workers East.